Laura Gomez-Murillo, a University of Wyoming master’s degree student from Colombia, begins a research adventure in Panama Jan. 28 by virtue of receiving a Smithsonian Tropical Research Institute internship (STRI). STRI internships are for early master's students or students who have not yet started graduate school. The purpose of these internships is for such students to work on short projects that can be completed within a three-month time frame and for the interns to gain skills that will increase their likelihood of success in graduate school. Tarwater, a UW assistant professor in the Department of Zoology and Physiology, who received a STRI short-term fellowship when she was a graduate student, says Gomez-Murillo is her first student to be awarded this particular internship. Tarwater is Gomez-Murillo’s adviser for her master’s degree program and co-adviser for the STRI internship. Tarwater adds the project will give Gomez-Murillo experience in executing and completing a short experiment and in writing up a manuscript for publication. “This project is looking at the joint effects of fragmentation and precipitation on tropical bird populations,” Tarwater says. 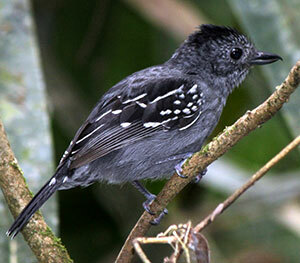 “The objective of this research is to examine the intrinsic and extrinsic factors that influence variation in territorial aggression in the black-crowned antshrike. Gomez-Murillo will use the variation in bird density and age structure they have observed across the rainfall-fragmentation gradient to examine how conspecific density, age of territory holders and the age of intruders influence the costs and benefits of territorial aggression. She will conduct a playback experiment in which she uses simulated territorial intrusions of males of different ages in sites across the Isthmus of Panama that vary in intensity of competition. In 2012, Gomez-Murillo received her bachelor’s degree in biology from Antioquia University in Medellin, Colombia, near where she is from. She published her undergraduate thesis on plant-pollinator interactions in two peer-reviewed journals. She has been a field technician or crew leader in the tropics for 10 years, including working with Tarwater since fall 2014 in Hawaii and Panama. 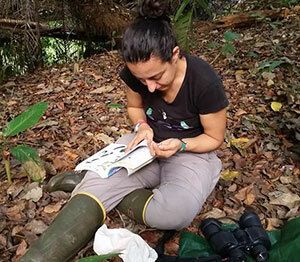 She has been Tarwater’s crew leader in Panama since 2016 and has been instrumental in adding a new method of aging tropical birds to Tarwater’s long-term study of avian demography (population growth and survival) in Panama. In addition to Panama, Gomez-Murillo has been part of different research projects studying birds in Peru, Colombia, Hawaii and Pennsylvania. She says she has always been interested in nature, with an early dream of becoming a marine ecologist. Gomez-Murillo says she has enjoyed working with Tarwater, and she expects the internship project will provide more clues about how bird fragmentation can affect competition and how the age of the intruders may influence the territorial aggression by the territory holders. “The internship is for three months and I hope, at the end of that time, I have all the recordings and experiments that I need to start with the data analysis and the writing, another process that I am excited to do because, although I have worked collecting data in the field for a lot of years, it is different to have the opportunity to write your own research,” Gomez-Murillo says. After the internship, Gomez-Murillo plans to stay another couple of months in Panamá to collect data for her master's project. She will try to analyze how fragmentation and climate change can affect the molt patterns, molt timing and the quality of the feathers of understory birds.